[SG] Goodwood Park Hotel | Are you hearing the Christmas carols? While many would be familiar with the yearly durian affair at Goodwood Park Hotel, what many did not realise is their luxurious spread dedicated to Christmas celebration! 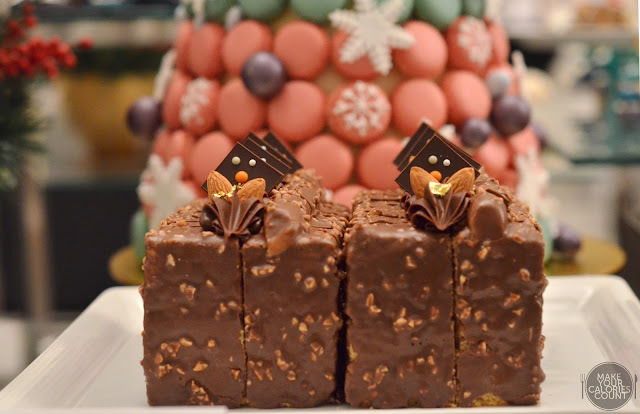 With each of the hotel's renowned dining establishments such as Gordon Grill and Coffee Lounge boosting their own Christmas cheers with tantalising treats, we are definitely in calories heaven. Basic instincts started to crawl out and judge us not, the sinfully sweet calories were too tempting for us to ignore and we gave in. These iconic durian puffs from Goodwood Park is almost a hallmark for quality pastries. 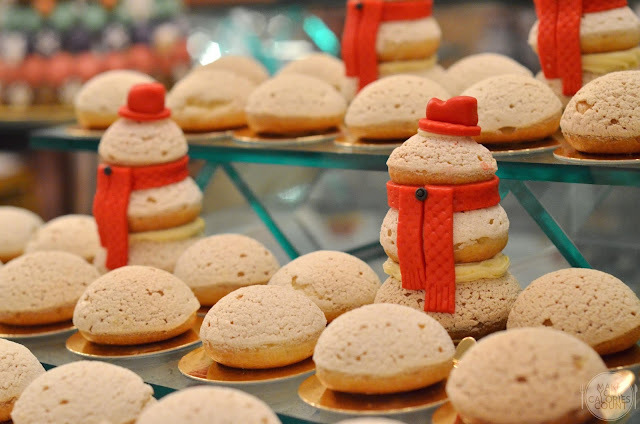 Expect nothing less than lavish swirls of viscous D24 durian wedged between choux pastry cases. Crisp on the outside and fluffy on the inside, you just cannot resist not when it comes in the form of a snowman. A classic at the hotel that needs no introduction for the foodies. If you love durian and some pillow-soft vanilla sponge, this is a must-try and make no excuses. 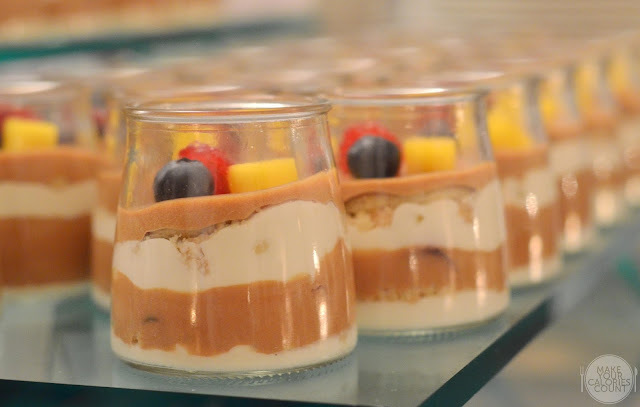 Ingeniously packed into jars, the delicate mousseline is a milk chocolate treat with a blend of acidity from the mango puree that cuts across pleasantly while complemented by the lightness of Chantilly cream. 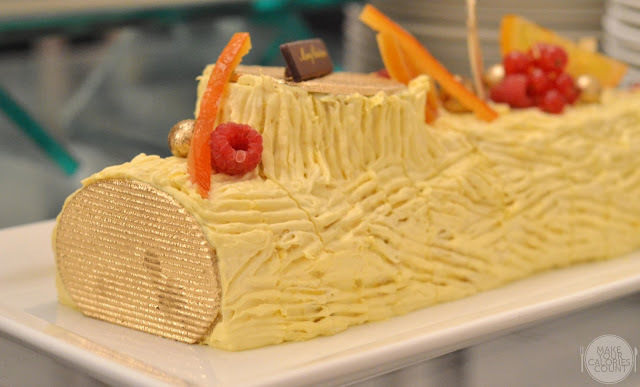 Expect alternating layers of chocolate mango mousseline, butter crumble, vanilla sponge with fresh fruit toppings, this would make a good serving portion at corporate or private functions. If you are craving for some rich calories, look no further than this caramel pound cake which was a hot favourite last year. Layered with creamy salted caramel and almonds, it is generously coated with a nutty milk chocolate glaze and decorated with whole almonds. An interesting Peranakan appetiser that needs no recommendation apart from the fact that this came with a festive twist with the use of shredded turkey breast meat that was flash-fried to retain texture and moisture. 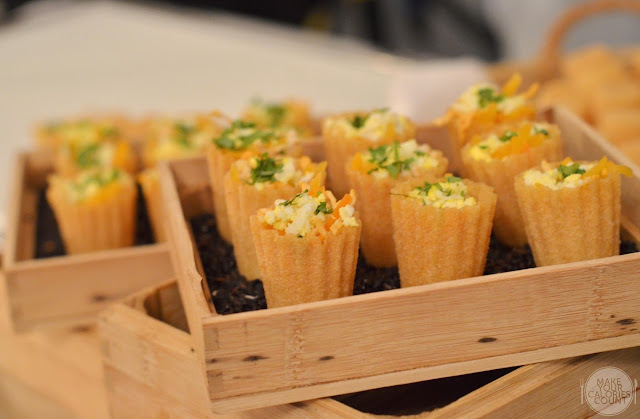 A huge fan of those pastry shells, it was also neatly packed with simmered turnip and carrots though I am not certain if these as takeaways would soaked up the crispy shells. 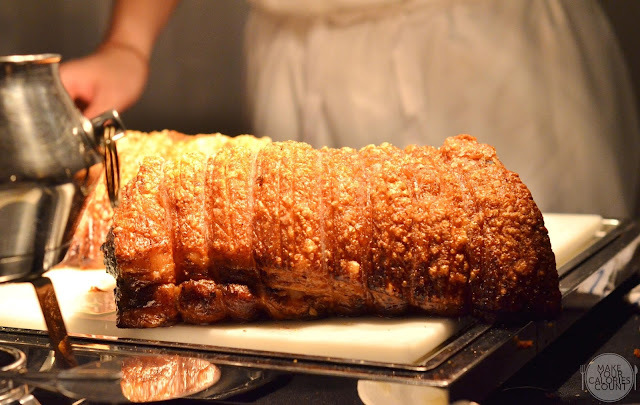 I can never say no to roast pork belly let alone one that crackles. Oh god, it was sinfully delicious with the crisp golden brown crackling skin that contrasted beautifully with the tender meat underneath. 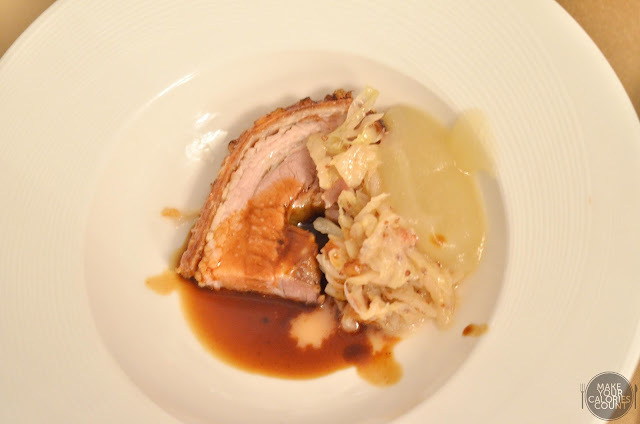 Roasted for at least three and a half hours with sherry vinegar, white wine and mirepoix, the prized Iberico pork is paired with some white cabbage that was almost like the German's sauerkraut. Top it off with some mustard and grated apple sauce, I crawled back for a second serving. A beautiful piece of prime cut, the red meat was cooked to perfection leaving a tinge of pinkness in the tender meat. Topped with a house-made thyme-Merlot sauce, it embodied the robust flavours in a wholesome offering. 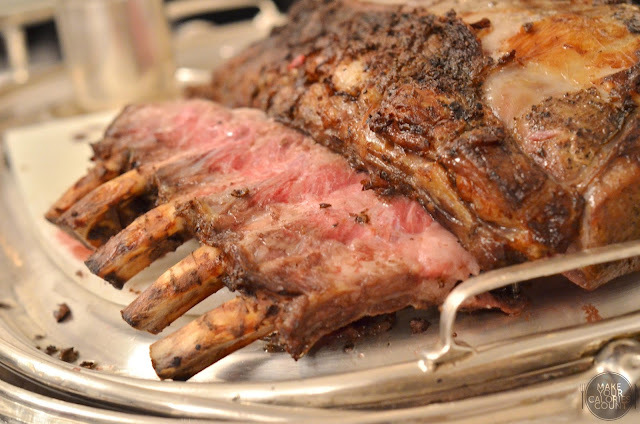 A must-try for prime rib lovers! 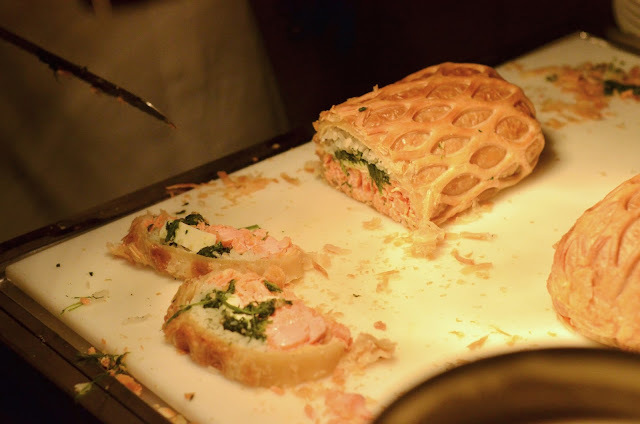 Encased in a fluffy pastry, the baked salmon was cooked to perfection and paired harmoniously with spinach saw contribution from the hot emulsified butter sauce made with a reduction of vinegar and white wine. Part of the buffet brunch, this is a hidden gem that deserves a lot of credit despite its simplicity. 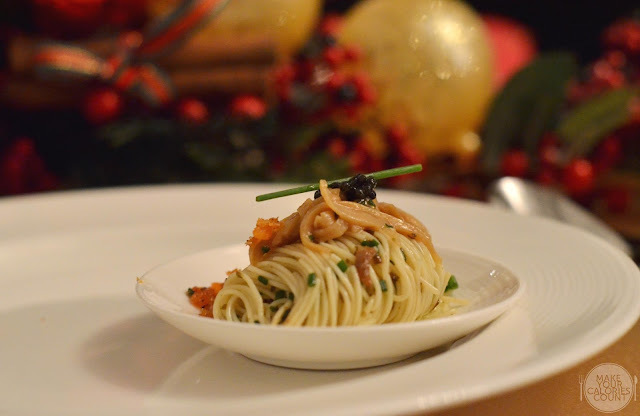 We enjoyed the lightness and robust flavours which were elevated by the perfect al dente texture of the pasta. Starting from 1 Dec 2015, all the various restaurants at Goodwood Park will be launching their festive feasting menu with the Gordon Grill. Offering 3-course set lunch from S$68++/person to Christmas buffet brunch at S$158++/person, it is a perfect spot for meals with business associates and family members. The cosy cafe, L'Espresso offers English afternoon tea buffet from S$48++/person during the first half of December before a more luxurious spread at S$55++/person from 18 Dec onwards! Known for their local fare and Taiwan porridge, the Coffee Lounge, starts serving up their festive dessert buffet at S$48++/person from 1 Dec onwards! If you are planning a Christmas party at home, head over to The Deli from 1 Dec to 26 Dec for some of the gourmet treats highlighted above. Advance orders of three working days are required and can be made at the counter daily from 9am to 9pm. Alternatively, give the dedicated Christmas Call Centre a buzz at 67301867/1868 from 10am to 6pm daily or find out more at festivepromotions.goodwoodparkhotel.com for online orders. Do note that the last date for order is 18 Dec 2015, 12pm! To make things better, for those seeking a festive getaway, there is an indulgence room package promotion that runs from 20 Nov 2015 to 7 Jan 2016 for the Deluxe Room at S$325++/night that includes buffet breakfast for two, S$55 worth of F&B credit and perks at Spa Rael! Are you hearing the Christmas carols yet? If not, it is time to head to Goodwood Park this Christmas!